Kelp supplements are sometimes used to help treat thyroid disorders, but dosages vary. It is always important to follow dosing instructions on the bottle no matter what supplement you are taking, but it is especially important with kelp. Concentrations vary, and the maximum daily dose is federally regulated. Discuss kelp supplementation with your doctor before using it -- he may recommend a specific brand and dose, or tell you to avoid it completely. Kelp contains iodine, which is the active ingredient that affects the thyroid. The amount of iodine in a particular supplement varies by type, age and growing location of the kelp, as well as harvesting and processing methods. According to a 2007 letter in "Environmental Health Perspectives," U.S. law caps the maximum dose of kelp to however much provides 225 micrograms of iodine per day -- for one supplement, that may be 350 mg, but it may be 200 or 400 mg for another. Federal labeling regulations require the recommended dose on the bottle to reflect the maximum iodine dose, so don't exceed the recommended dose unless specifically recommended by your doctor. The maximum daily kelp dose still provides 150 percent of the iodine you need in a day, and taking more can cause problems. Getting too much iodine can make thyroid problems worse, and high doses around 2,000 mcg can be toxic. 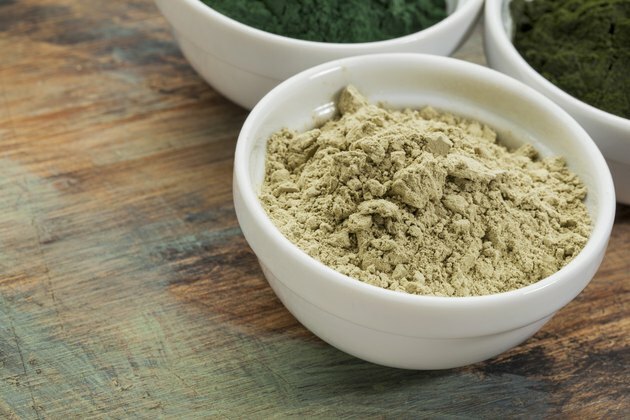 Kelp supplements may also contain arsenic -- the EHP letter talks about a woman who suffered hair loss, fatigue and memory loss for two years while regularly taking up to four times the recommended dose. At that dosage level, you would be getting about 600 percent of your iodine needs, which can result in symptoms like nausea and vomiting, but the symptoms were eventually traced to the arsenic in the supplement. The inconsistency of iodine content in kelp supplements makes them a poor and difficult-to-control iodine supplement. According to MedlinePlus, there is not enough hard evidence to determine that taking kelp actually improves iodine levels, let alone helps thyroid disorders. Even if it were a proven iodine supplement, it would only help if your thyroid disorder was caused by iodine deficiency -- not all thyroid conditions are, and an iodine deficiency is quite rare in developed nations due to food grown in high-iodine soil and iodine added to table salt. If you suspect you have a thyroid disorder, visit your doctor to have it definitively diagnosed. The most common symptoms of thyroid disorders, like changes in energy levels, weight gain or loss and skin changes may also be caused by a number of other disorders, including simple things like nutritional deficiencies. If your thyroid isn't functioning properly, your doctor will determine the cause and prescribe the appropriate medication. Attempting to self-treat with a kelp supplement may make existing thyroid conditions worse, or cause one where it didn't previously exist. Kelp supplements may also slow blood clotting, impair fertility and interact with other medications and supplements.